November 3, 2016 - Ground broke on the 100,000-square foot Worcester Sports Complex in May. With construction well underway, the complex is expected to open in August 2017. It will have two full-size ice rinks, an athletic training and conditioning center, locker rooms, meeting spaces, pro-shop and other retail and entertainment concessions. The building is clad in flush metal panel and anodized aluminum curtain wall to express a more sophisticated, modern urban take on a traditional, pre-engineered metal building. The entry tower, lit by LED edge lighting, will be visible from the highway and will signal enhanced activity in the neighborhood. 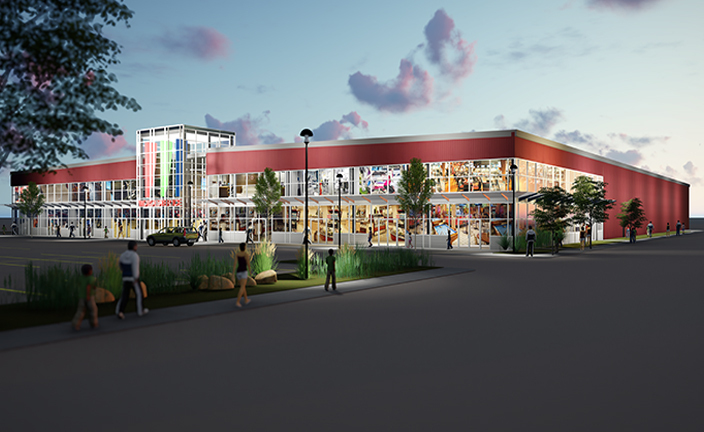 With over 40,000 sf of retail tenant space, the Sports Center is intended not only as a premier ice rink destination but also a beacon for commercial business. A key component of the design was to include large glass facades on three sides of the building, so that the retail and commercial tenants each have a “window on the street” and an opportunity to participate in the activity of the neighborhood. Click on New England Real Estate Journal to read their article.